For most of Canada, winter means wind, rain and snow. That light, fluffy snow can become a very weighty problem when it piles up on your roof. Ice dams are thick bands of ice around the edges of your roof. These dams prevent water from properly running off your roof, and as they grow, they can cause significant damage to your home. The main cause of ice dams is warm roofs. If you don’t have the proper amount of insulation in your attic, heat will leak out through the roof. This then causes any snow on the roof to melt, and run down towards the gutters. As the water hits a colder part of the roof, it freezes and begins to form an ice dam. As more and more snow melts, the dam just keeps growing. The ice dam prevents any other melting snow from getting into the gutter so it can properly run away. Instead, water backs up behind the dam or runs over the top of the gutter causing huge icicles to form down the side of the house. Recessed lighting in the floor below. If your attic has been converted into living space, there will likely be even greater heat loss through the roof. If this is the case, talk to an expert about getting the proper insulation. Or if you have a wood burning stove in your house, where the chimney goes through the attic out to the roof, there is the potential for the attic to really warm up. This requires very special treatment when insulating, as these chimneys are so hot, there is a fire concern if not done properly. What kind of damage can ice dams cause? As mentioned above, ice dams can cause real damage to your home. Shingles can lift, gutters can be torn off, and water can leak into your home. This can result in damage to your attic, insulation, drywall, and electrical work, not to mention the dangerous mould that could form as result of the dampness. What can you do to prevent ice dams? Make sure your attic is well ventilated. Check that your attic is properly insulated, to prevent heat from escaping through the roof. Have an ice and water shield membrane installed when it’s time to reshingle your roof. Remove leaves and other debris from your gutters, to allow melting snow to run away. Use a roof rake or hire a professional to clear the snow off your roof. Safety first. Don’t go up on the roof yourself. How can you remove ice dams? Number one rule, don’t try this yourself. If an ice dam forms around the edges of your roof, DO NOT try to remove it yourself. If you chip at it with an axe or hammer, you are likely to punch a hole through your shingles or your gutter. If you try using a chemical ice melt product, again you could cause serious damage to your shingles. And don’t even consider getting out a heat gun or torch. You know where that might lead. Even if you consider yourself pretty handy, this is one time when you should really call a professional. You may take a few steps, such as using a snow rake to remove snow from the roof, to prevent ice dams from forming, but once they’re there, it’s time to call in the professionals. Keep your roof in good repair. Do some maintenance, particularly in the fall. Clean the gutters. 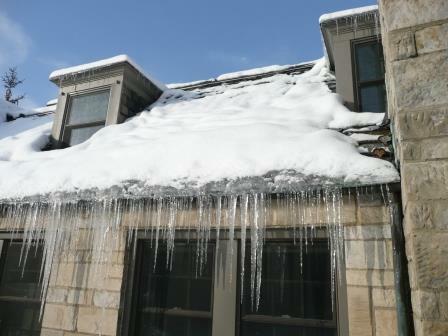 Water can get trapped in clogged gutters and can form ice dams in the winter. This can prevent any melting snow from flowing away, and may cause it to flow into your house instead. Hire a professional to remove snow piling up on your roof. Snowy roofs are slippery, and you don’t want to end up with an injury from falling off the roof. Make sure your attic is properly insulated to prevent heat from leaking out through the roof. This will not only keep heating costs down, but it will prevent any accumulated snow from melting too quickly, possibly causing water to enter your home. Or from melting and refreezing, adding additional weight, and causing even more accumulation. Make sure you have the right insurance on your home this winter. If the worst happens, and your roof sustains serious damage, don’t be caught without enough coverage to complete the repairs. When winter strikes, we have more to worry about than shovelling our driveways. Your roof can collapse if ice and snow build up to a dangerous weight. This type of loss is generally covered by your home insurance. However, if your roof is nearing its life expectancy, or is in poor repair, your settlement could be limited. Often insurance providers will limit coverage to the depreciated value of the roof, rather than the replacement cost. The resultant damage to the inside of your home will also be covered by most home insurance policies. And if you have to move out, while your home is being repaired, your additional living expense insurance will come into play. This is sometimes included in policies, and other times can be added as an additional rider, allowing you to choose the amount of coverage you need. Any damage caused by the weight of ice and snow will be subject to a deductible. Deductibles can range from $250 to $5,000. This is another good reason to make sure your roof is well maintained, and kept clear of snow. So, if you enjoy skiing, skating, and sitting by a cozy fire, you know there are many things to love about a Canadian winter. Ice dams aren’t one of them. But if you keep your house in good shape, and make sure your attic is well sealed and insulated, you’ll have one less thing to worry about during a big snowstorm. For more information, or to get a home insurance quote, contact Square One at 1.855.331.6933.